If you’ve ever worked with a wood surface before, you know that using a belt sander is the first step and an absolute must. These powerful tools utilize the movement of fine-grit belts and help shape and evenly finish all kinds of woodworking projects. They are aggressive and gentle at the same time. They remove wood, round and shape narrow edges and do just about everything you can imagine with a misshaped, disobedient piece of wood. One thing is for sure – these multi-functional tools save time and money. The belt sander hasn’t become an essential tool in the homeowner’s arsenal yet, but every capable professional, carpenter, and DIYer should own one. Whether you’re an experienced DIY enthusiast, a hobbyist or just someone who wants to explore the world of belt sanders, before embarking on the journey of woodworking – Sander Solutions is the ideal place to learn, conduct research, check out the latest product reviews, find tips, tricks and more. If you’ve never owned one before, don’t worry – our short buying guide below will certainly come in handy. And, if you’re too impatient to read through it and want to get straight down to business, we’ve got you covered. Scroll down and find out what the best models on the market are – we’ve cherry picked them just for you and you will find one that suits you regardless of your budget. Here are our recommendations at various price points. Please note that prices fluctuate so treat these as a rough guide. The 6321 is the best cheap belt sander - one that deserves a special place in every homeowner’s repair kit. Lightweight (it weighs only 6 pounds), compact and portable, this is practically a household essential. Featuring a powerful 7-Amp motor, a quick-release sanding belt (great for adjusting grits and swapping sandpapers) and a spacious, detachable dusting bag, the 6321 is a combination of user-friendly design and high performance. This machine is ideal for DIY projects and quick repairs and – no matter what your budget is, the 6321 certainly won’t burn a hole in it. Runner up – Skil 7510-RT 6 Amp Corded Electric 3" x 18"
This refurbished model is an instant classic – a new and improved version of one of the best budget sanders ever. The 7510-RT features a good, reliable 6-Amp motor and a highly functional micro filtration feature, meant to capture and contain fine dust particles. You certainly won’t make a mess with the 7510-RT, but it will still get the job done. Perhaps the perfect gift to someone looking to get into the word of woodworking or simply a good investment for homeowners who like to be prepared in case something goes wrong, this machine delivers on all ends. Of course, it’s also incredibly user-friendly and extremely affordable, which is why we’ve decided to include it in our list. Packing more power than its 6.5-Amp motor suggests, the ZRR2740 is a powerful piece of machinery, perfect for experienced hobbyists and dedicated furniture makers. This is a sturdy, stable, durable product – featuring a two-fan system to ensure overheating never occurs. The ZRR2740 is great for long work sessions and day to day use. Ease of use, soft-grip handles and a 12 feet cord with rubber cord wrap are some of the best features of this powerful little machine that manages to deliver top notch performance and remain lightweight and compact (it weighs only 7 pounds). Most definitely worth the money. In fact, this is one of the best sanders money can buy. This is one of the best beginner-friendly models on the market today and we simply had to include it in our list. The ZRBE319 features a good 6-Amp motor, performs great on a wide variety of softwoods, doesn’t cost much and it delivers steady performance all around. While this may not be the perfect belt sander for professionals and furniture makers, the ZRBE319 is a great machine for hobbyists and beginners. The fact that this is a refurbished model proves one thing – the demand for the original was so great that the manufacturers were forced to refurbish and then release it onto the market, yet again. Packed with unique, ground-breaking features and designed for detail work, the 38536 is the best option on the market for creative individuals, artists and woodwork artists alike. Featuring a subtle, low-power motor (which makes the machine steady for precise work), a tilting head (for hard to reach places) and weighing only 4 pounds – which makes it incredibly portable and enables the artist to use the machine for hours on end – Proxxon’s 28536 is by far the best artist’s belt sander on the market today and one of the best overall within the price range. If Proxxon’s 38536 is the best belt sander for artists, then Triton’s TA1200BS is the top choice for professionals. Offering a variety of unique high end features and a combination of sturdy design and excellent performance, the TA1200BS is, simply put, a great investment for serious woodworkers. The TA1200BS comes with a vertical stand and clamps – on previous models, hundreds of users complained about sanders lacking this feature and Triton have finally delivered and made their dreams come true. On top of that, this multi-purpose machine features a powerful 10-Amp motor and variable speed control. Truly, a professional’s gem. We’ve managed to get our hands on some of the best belt sanders available to mankind and we’ve had the pleasure of reviewing a lot of them. But, the best belt sander we’ve ever had the pleasure of using, by far is Makita 9404 and that is why it deserves a special spot on our website. Makita 9404 is a powerful, multi-functional, multi-purpose machine. Featuring a strong 8.8-Amp motor, the 9404 can handle wood, metal and layers upon layers of paint with the utmost ease. This machine comes with a 16-foot cord and it is ideal for professionals, handymen and contractors, but even hobbyists will like it - ease of use is one of its strongest features. Even though the 9404 is powerful, it manages to say subtle, almost completely silent and, at the same time, neat – the dust collection bag works very well. Does it have any flaws? Apart from being more expensive than most of its 'competitors', Makita’s 9404 doesn’t have any flaws. And even if you’re hesitant to go the extra mile and invest into this machine, once you take that step and purchase it, you will realize what a bargain it really is. Click here to visit our Complete archive of belt sander reviews. There’s a wide variety of options to choose from but, as with any other product, there are a few features that you should look for. Even if you’re just a DIYer or a hobbyist, these machines can be a substantial investment. This buying guide is meant to aid you in your shopping – read it before you reach for the wallet. What do you plan on using the sander for? These devices have a number of practical uses. Handymen trim, sand, shape and smooth wood using belt sanders, but some people also use them to remove stains or old paint. Some are great for removing paint and rust from metal too. It goes without saying that they come in all shapes and sizes. Consider the size of the project(s) you’ll be working on – you may need a small, hand-held unit or an industrial sander. If you intend to work with soft woods or perhaps want to work on projects that require more detail, look for one with a rounder front nose. Regardless of how powerful the motor of your model is and no matter how fast its running, you want the machine to stay in place and, ideally, you want the belt to stay centered. Look for belt sanders with dedicated systems for track centering as this will save you a lot of trouble. Beginners don’t realize this at first, but holding a 10-pound oblong in your hands for 10 minutes and working with it for 3 hours straight are two completely different things. Some of these devices are indeed intended to be portable, but if they weigh more than you can handle not only will you be uncomfortable after using them for a while, you’ll also need to push really hard to make the device properly smooth out a surface. The weight of the device is not where it all ends when it comes to comfort. Make sure to look for a sander that has decent grip and feels good in the hand. With all of the above taken into consideration, the amount of information you’ll come across will be overwhelming and often conflicting. We recommend you do your own research and seek out unbiased reviews - this website, for example, has a ton of expert-written reviews and a lot more info. But also check the pros and cons mentioned by Amazon customers. One man's dream machine is another man's worst nightmare. Not only will this help you get an ideal belt sander that suits your needs, you’ll also avoid being ripped off – why pay a lot of money for a product you know next to nothing about when you can read a professional review of a similar, much cheaper one, on our website? Breathing dust is not just unpleasant, it’s really bad for you. Sanders can produce a lot of dust, so it’s highly recommended that you wear a dust mask, even if your belt sander has a decent fan/dust disposal system. 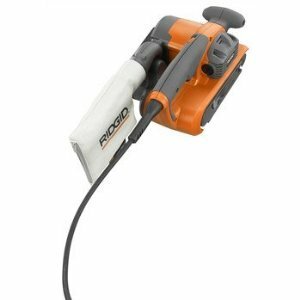 Some of these devices are great for working on metal, but what many beginners are unaware of is the fact that sanding metal creates sparks. This means if the sparks mix with the sawdust (in the machine or in the dust bag) they may start a fire. Always carefully clean or even vacuum the sander. Ignoring this seemingly unnecessary precaution is the main reason handymen have war stories to tell. It’s common sense to unplug the machine when emptying the dust bag or changing belts, yet many of us forget to do just that. Perhaps it’s because we get carried away working on a piece of wood? Who knows, but what matters the most is – always unplug a machine if you’re about to change something on it. Our goal here at Sanders Solutions is to provide valuable information to our readers – answers to your questions, solutions to your problems. 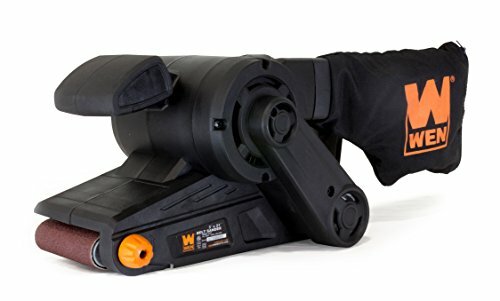 We aim to be the biggest online resource for woodworkers, DIYers, woodwork artists and handymen looking for the perfect belt sander to complete their home arsenal of arsenal of tools. Feel free to look around our website and make sure to pay us a visit again!